I have a small light weight shop vac with a short hose. The long reach hose works well to clean high planter shelves and ceiling vents. great for the stairs, ceiling fans, etc. great for grooming my dogs who are afraid of the vacuum. have vacuum in one room while vacuuming my dogs in another. I have an up right vacuum cleaner which is rather heavy. This extender hose is great for cleaning stairs and along the edges of rooms and under furniture. i just leave the vacuum in one spot and I can clean easily without dragging that heavy vac along with me or try to balance it on the stairs. I does not fit perfectly, but every vacuum cleaner is different, however, it has made cleaning much easier. it was just i thought it would be and it is long and fits any vacuum i like it. I like it very much. Its light and stores well. This is the best purchase I have made this year! 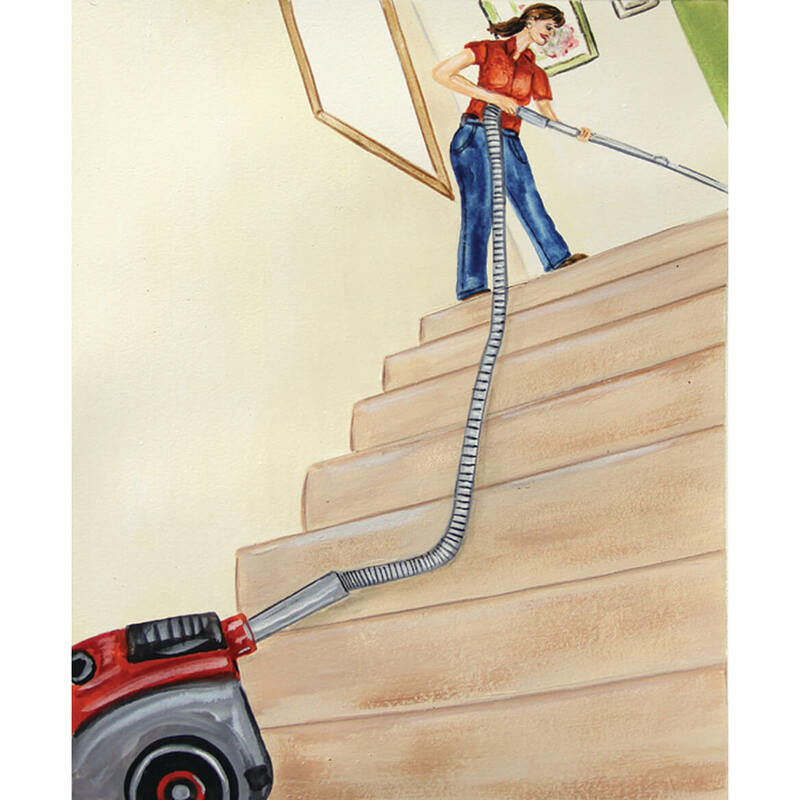 I use the long reach vacuum hose to clean the stairs in my home. It is the best. No more hassle with trying to balance the machine on the stairs while using the short hose attachment. I leave the machine at the top of the stairs and the hose reaches all the way to the bottom. Also, I use the long reach hose to vacuum my truck. I bought 3 of these hoses to us in my wood shop. I used them to hook up my sanders, miter saw, and drill presses to the dust collection system. They really work great and are a lot cheaper than any other hoses I have found. These hoses are very well made. This is a great item. A little heavier than I expected, but still a good buy. Wish I could take the end off so it would bend around the curve in my heater vents but other than that, I love the reach it gives me for other uses. This is the best thing I ever bought! I couldn't clean my carpeted stairs. My back won't permit me to drag the vac. up, and the pipe wasn't long enough. Enter the hose extention. I love this. Now, I can get to the top of the stairs, and vac. 12 foot ceilings. This is a Noble Prize winner! That extra needed length. All positive experience. Really helped me with the stairs. I had one before and my husband jammed a piece in it to try to get everything to stay instead of holding it like I do and now I can't get the piece out. It really doesn't work great with my Bissel pet vac. I have to hole the hose and I believe I attach it to the extension wand. When ever I use it, it is like putting a puzzle together. You have all these pieces and you have to figure out which one to use and what will fit. Some days I just give up and take my heavy vac up the steps it takes less time than putting the puzzle together. I only got an other one, because my vacuum weighs a ton. IT WORKS WELL IF THE END DIDN'T COME OFF. THE ATTACHMENTS DIDN'T FIT MY HOOVER OR MY DAUGHTER'S SHARK. DO THEY FIT ANY VACUUM? I GLUED THE END AND I HOPE IT STAYS ON. Long reach, but hard to use. It fits into my Miele canister vacuum, but I have to remove the vacuume cleaner's own hose, and insert this directly into the vacuum cleaner. It does generally stay in, if I don't pull it the wrong way. However, the floor tool attachments don't stay on. As I vacuum, I have to hold the end of the hose with one hand, and the attachment with the other. The problem is that the ends of this hose are made with smooth, hard plastic with no grip. If they'd been made with rubber, or some other substance with a lot of grip, attachments probably would have stayed on, and it would have been a lot easier to use. The long hose is very handy for hard to reach places. Hose was used to clean under and around furniture. The hose came loose from the attachment and wouldn't re-attach without my coming up with a solution to re-attach. I used the product to reach the top of the stairs while leaving the vacuum at the bottom. It worked great at first but then the hose pulled off of the adaptor. The matrix of the hose is a heavy metal coil. I guess the weight of it was too much for the plastic covering. I had not used it right away so was unable to return it in time. Very disappointed with this hose. None of the connector attachments fit my Hoover Wind Tunnel, so the only way to connect the hose is by shoving the tapered end into the attachment hose on the vac. This is not a firm attachment, so I need to hold it together with my left hand while using the suction end with my right hand. The "14 ft." extended length also doesn't quite reach from bottom to top of my (normal height) stairs. The single page illustration that came with the hose (made in China) is so small and faint that it is no help whatsoever in figuring out how to use the hose! Bought this for extra hose for sweeper and won't fit. So I don't have to carry the vacuum up the stares while cleaning. I wanted a longer hose and this was something I could use. I couldn't find this item anywhere else. Haven't seen anything like it before when shopping so "gonna give it a try. To better reach hard to reach areas that are too high. Hopefully not dragging up vacuum up stairs. needed a long hose, review seems ok.
Hubby wants this for his shop vac because the shop vacs don't give you too much vacuum hose to begin with and sometimes they won't reach where you need to go. My husband chose because of extra attachments. My vacuum has a very short hose. I just got a hand held vacuum cleaner. Hopefully this will allow me to rest the vac so I don't have to hold it all the time and will also extend how far I can reach. Wanted to try this. This is something I could use in my apartment. I needed something so I wouldn't have to bend over so far after my surgery. Because mine is too short. Should be convenient for vacuuming stairs. It will fill a need. Better reach by adding this to your regular vacuum hose. so I could reach hard to reach places like my vehicles curtains and etc. Ability to reach length of stairs without relocateing vacuum . Need something to make it easier to do stairs. Need to reach places I can't reach with my vacuum now. I have an upright vacuum, so I wanted a hose long enough to vacuum my car. Will this hose fit new Kenmore canister vacuum? BEST ANSWER: Thank you for your question. The long reach vacuum hose comes with three attachments to fit most vacuums. The small attachment is 1 1/4" in diameter. The large attachment is 1 3/8" in diameter. The D-shaped attachment is 1 3/4" across by 2" high. We hope this information will be of help to you. Do you know if this has an adapter to fit a Shark Rocket? BEST ANSWER: Thank you for your question. This attachement fits most vacuums. We hope this information will be of help to you. Does this work with Miehle? BEST ANSWER: Thank you for your question. The long reach vacuum hose comes with three attachment, so that it will fit most vacuums. The smaller attachment is 1 1/4" in diameter the larger attachment is 1 3/8" in diameter and the D-shaped attachment is 1 3/4" across by 2" high. We hope this information will be of help to you. how to get the hose to stay connected to vacuum hose, it keeps slipping off? BEST ANSWER: The hose goes in the hole and has some adapters to help connect it. However you might wish to try the rubberized shelf paper mat with the tiny holes. Cut a narrow band and wrap it around the hose before putting it in the sweeper. That should tighten it up for you. We had an old sweeper and I have used that shelf paper matting to tighten things up by wedging it in. Push it on real good and then give it a little twist, I found that works best for me. Just make sure when doing stairs that it doesn't get hung up on the stairs as that may make it come apart. Other than finding a way to keep it on the vacuum it works great. Look at the pieces that are used to make your connection. I took one end apart and used only the part that fit best. Works fine. I have the same problem. Also, it wouldn't fit on the vac I wanted it to but fit on another one with the adaptor. I din't really have any problem connecting the hose. It just stayed in place. How do you use the attachments. How do you attach them? BEST ANSWER: Thank you for your question. Once you have gotten the adapter on the vacuum you attach the long reach hose to the adapter and attach the hose that came with the vacuum on the other end of the long reach hose.We hope this information will be of help to you. will this fit a dirtdevel stick vacuum? BEST ANSWER: Thank you for your question. The long reach vacuum hose comes with three attachments to fit most vacuums. The diameters of the attachments are 1 1/4" and the other one is 1 3/8" and there is a d-shaped attachment that is 1 3/4" across by 2" high. We hope this information will be of help to you. will this fit a upright bissell powerforce helix turbo? BEST ANSWER: Thank you for your question. The smaller round attachment has a diameter of 1 1/4", the larger round attachment is 1 3/8". We would recommend measuring your vacuum to see if these measurements will work for you. We hope this information will be of help to you. I have a central vacuum with a very long hose. I would like to use this as a short hose instead of always dragging the long one out. How long is it when it is not stretched out? Thanks! BEST ANSWER: Thank you for your question. It is 46 inches long. We hope this information will be of help to you. Does it fit a Rainbow vacuum cleaner? BEST ANSWER: Thank you for your question. Vacuum extension hose includes adapters in 3 sizes to fit most vacuums. We hope this information will be of help to you. The sears kenmore upright elite did not think of the customer when the hose extension was added. Great vacuum other than that. I want to make it great without Sears. Please tell me this will work with this Kenmore upright elite ? BEST ANSWER: Thank you for your question. This item has 3 adaptors to fit most vacuums. We hope this information will be of help to you. will it fit a Shark Lift-away? BEST ANSWER: Thank you for your question. 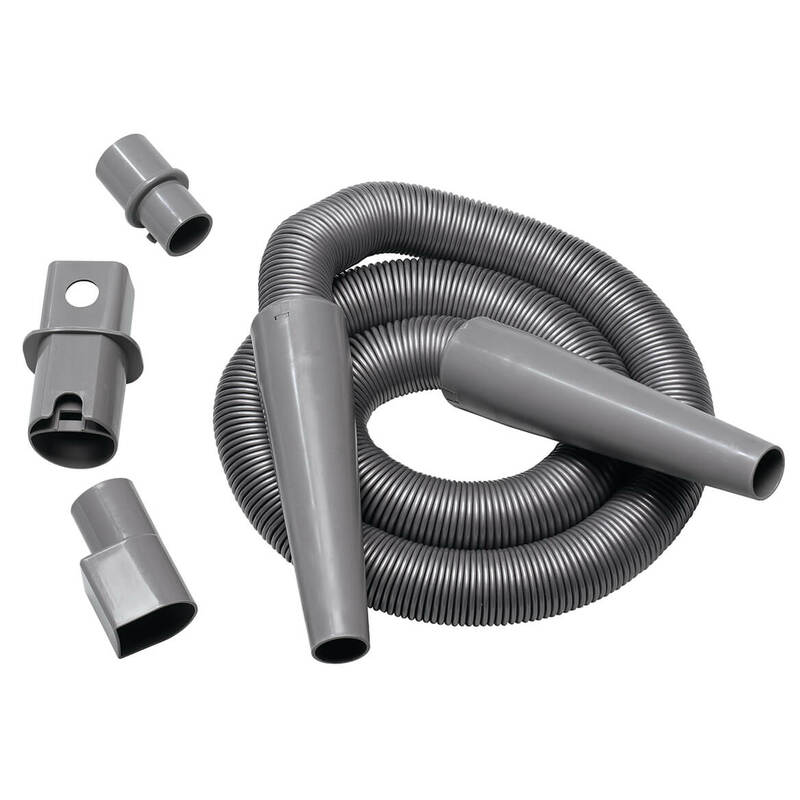 This Vacuum extension hose includes adapters in 3 sizes to fit most vacuums. We hope this information will be of help to you. what are the 3 sizes of the attachments, will this fit my shark nv352 with the extension to the shark? •When not is use the hose is 46”L. will it fit a hoover upright vacuum cleaner? BEST ANSWER: Thank you for your question. We have included the adapter sizes for you to determine if any will fit your vacuum.We hope this information will be of help to you. will it fit a small wet vac? BEST ANSWER: Thank you for your question. The Long Reach Vacuum comes with three adapters. The small round attachment has a diameter that is 1 1/4". The Larger round attachment is 1 3/8" in diameter. The D-shaped attachment is 1 3/4" across by 2" high. We hope this information will be of help to you. does this hose fit a dyson dc 24? BEST ANSWER: Thank you for your question. This vacuum includes adapters in three sizes to fit most vacuums. We have included the adapters measurements below. We suggest measuring your vacuum before purchasing. We hope this information will be of help to you.